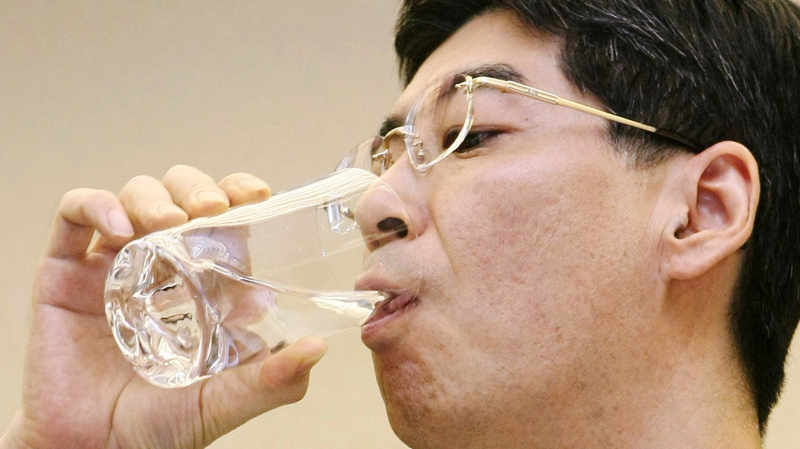 To Assure Japan, Official Drinks Water From Fukushima Puddle : The Two-Way The Japanese MP had previously said he was so sure of its safety, he would drink a glass of water taken from inside the building of the crippled nuclear power plant. He had assured Japan that the water inside the nuclear reactors crippled after the tsunami was safe. Yasuhiro Sonoda, a Japanese MP, said he so sure of the safety, he'd drink a glass of decontaminated water from the Fukushima reactor in front of reporters. With TV cameras rolling, the parliamentary secretary for the Cabinet Office, Yasuhiro Sonoda, downed a glass of water originally taken from a puddle located inside the building that houses reactors No. 5 and 6 at the troubled Fukushima Daiichi plant in an apparent attempt to prove that progress is being made in the plant clean-up work. It wasn't to quench his thirst. In a tense scene that might have seemed more appropriate in an episode of "Fear Factor" rather than under the unflattering fluorescent lights in the briefing room at Tokyo Electric Power Co.'s headquarters, Mr. Sonoda finished the glass in two swift gulps as a way to show the water – that had been through a process to decontaminate it of radioactive elements — was safe enough to drink. As The Guardian reports, the issue here is that the cleanup process at the nuclear plant has been complicated by water building up inside the reactors. The water has been treated and in order to relieve the storage problem, it has been used to water the trees outside the reactor. People have questioned the safety of that move and Sonoda's drink was meant to assure the public. The Guardian adds that Sonoda said drinking the water was not a publicity stunt. "I am aware that just drinking [the treated water] doesn't in itself mean that safety has been confirmed. The best way to do that is to present data to the public," Sonoda said according to The Guardian.